Data found in the Association For Creative Industries' (AFCI) 2016 Creative Products Size of the Industry Study suggests an increase in kids crafts activities. Kids crafts ranked third among crafts with the highest level participation in the United States, with 37 million households participating in the past 12 months. 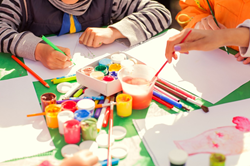 “Our research shows 49% of survey respondents plan to continue or increase their involvement in kids crafts activities in the next 12 months,” say Keri Cunningham, Senior Director of Marketing and Research, AFCI. Last week marked the official start of summer in the Northern Hemisphere, which signals the end of the school year. The Association For Creative Industries’ (AFCI) predicts an increase in kids crafts activities this season, according to the data found in AFCI’s 2016 Creative Products Size of the Industry Study. Kids crafts ranked third among crafts with the highest level participation in the United States, with 37 million households participating in the past 12 months. It followed the popularity of painting and drawing activities, which ranked first with 41 million households, and edible arts crafts, which ranked second with 39.7 million households. The study defined kids crafts as “fun and creative products, kits, and projects created specifically for toddlers, preschoolers, and school-aged children.” The findings comprise voluntary responses of 6,209 U.S. adults ages 18 and older collected between October 2015 and September 2016. AFCI performs ongoing research of the creative products industry with its research partner, MaritzCX®. AFCI will release new data in August, which will include statistics on the distribution channels where consumers purchase arts and crafts products. The full report is available at http://www.afci.global and is accessible to AFCI members for free. Non-members interested in purchasing AFCI’s research reports can review the report overview and should contact Keri Cunningham, Senior Director of Marketing and Research, at kcunningham(at)afci.global. MaritzCX® software and services help organizations see, sense and act on the experiences and desires of every customer to increase retention, conversion and lifetime value. With an unmatched combination of customer experience (CX) software, research science, vertical market expertise and managed program services, MaritzCX ingrains CX intelligence and action systems into the DNA of business operations through its 12-point CXEvolution process. To take the complimentary CX assessment, visit http://www.maritzcx.com/assessment. For more information about MaritzCX, visit http://www.maritzcx.com.